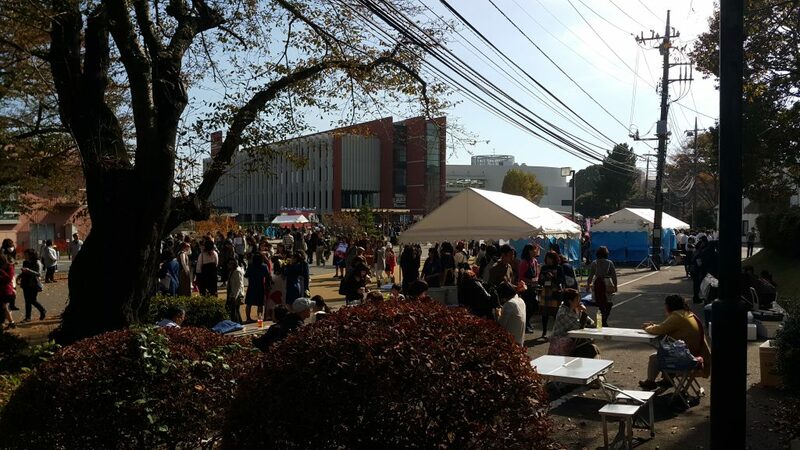 The culture festival at Ibaraki Christian is a huge undertaking that all of the college clubs, the high school, junior high school, and kindergarten participate in. 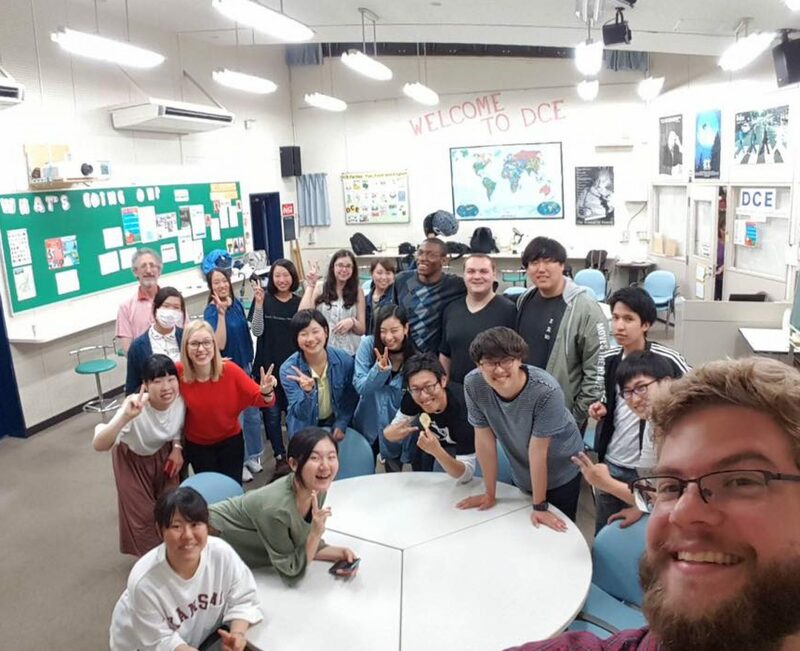 Wednesday was used for preparation and set up, Thursday the college opened their festival activities, and on Friday everyone’s activities were up and running for the day. Lizzete and I enjoying our chocolate coated marshmallows complete with rainbow sprinkles. The students set up booths where they sell foods, have items related to their clubs, and host games, although booths with food are by far the majority. As a vegetarian with food allergies, I was personally restricted to chocolate covered marshmallows and chocolate covered bananas, but for people with a little more leeway there’s a veritable smorgasbord of options: takoyaki, curry, soups, karage, cotton candy, yakisoba, and more. 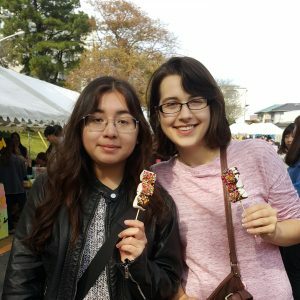 Honestly, most of the time at the festival is spent walking around with your friends, looking at the booths, and being lured into buying food by enthusiastic students. But of course, there is plenty more to do. The five interns (Donovan, Brianna, Lizzete, Martin, and I) went together, and while we spent quite a bit of time eating, we also watched dance performances, went to the tea ceremony club’s demonstration, bought cute accessories from the art club, watched movies made by the film club, and even walked through a haunted house (known as an obakeyashi in Japan). Out of everything, I think the tea ceremony and haunted house were my favorites though. At the tea ceremony area, Brianna and I payed the ¥500 fee for two people, and the club members guided us over to a table sitting across from the gorgeous set up seen in the picture above. While I’ve been to tea ceremonies before, watching the slow, measured motions of the person performing the ceremony is always captivating. 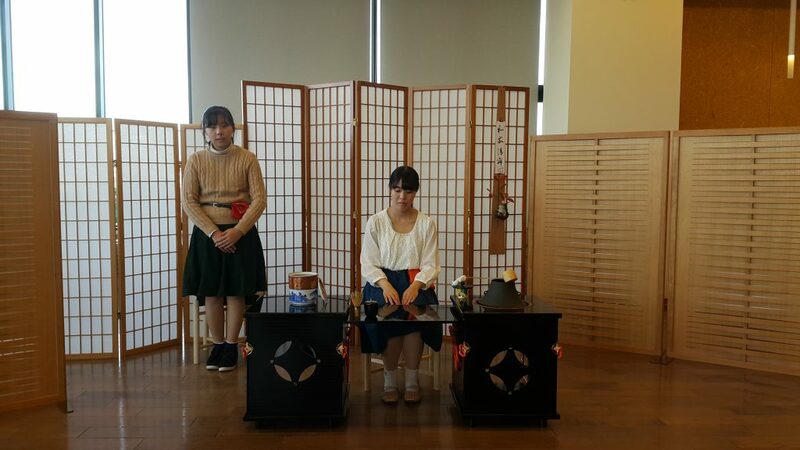 The students presented us with two traditional candies to eat in order to negate the bitterness of the tea, then sat down at the table across from us and preformed the actual ceremony, making the hot green tea with matcha powder and boiled water from the deep pot on one side of the table. You know those ASMR videos that have become so popular as of late? The ones with people talking softly to the viewers or kneading putty repetitively? Watching tea ceremonies gives me the exact same kind of calm feeling, like I’m about to melt into a puddle of utter relaxation. In other words, I highly recommend it. For the haunted house, Lizzete, Brianna, and I went together. Now, I have to admit, while I am a huge horror movie fan and have an extremely high tolerance for scary things, I am an utter wimp when it comes to haunted houses. I will cry, scream, and blindly throw others in front of me when people jump out at us. But, even considering this, I still think it’s safe for me to say that the haunted house at the culture festival was downright terrifying. Pictures were not allowed, so please accept this gif as an accurate representation of my feelings during the haunted house. The students transformed a classroom into a dark and winding maze. Ushered in with only a weak, red tinted flashlight that cast an eerie glow on the surroundings, we made our way through. At some points, the walls around us would begin to shake, the sound of pounding fists on metal jolting us forward. At others, we found ourselves frozen in fear at the sight of pale women with limp black hair falling around their faces sitting silently before us. Just when we thought we had passed out of danger, the silent specters would suddenly reach out, or rise to their feet and begin to follow us with unnervingly soft, slow footsteps. Lizzete, thankfully, managed to keep her cool for the most part. Brianna and I, on the other hand, found ourselves gasping for breath from screaming as we stumbled out of the doorway at the end of the maze. I steadied myself with a hand on the table by the door, while Brianna quite literally collapsed to her knees. I don’t know whether this is an incentive to stay away from the next haunted house for most people, or an incentive to go. All I can say is: If you want a good scare, the haunted house at the culture festival certainly came through for us in that regard. 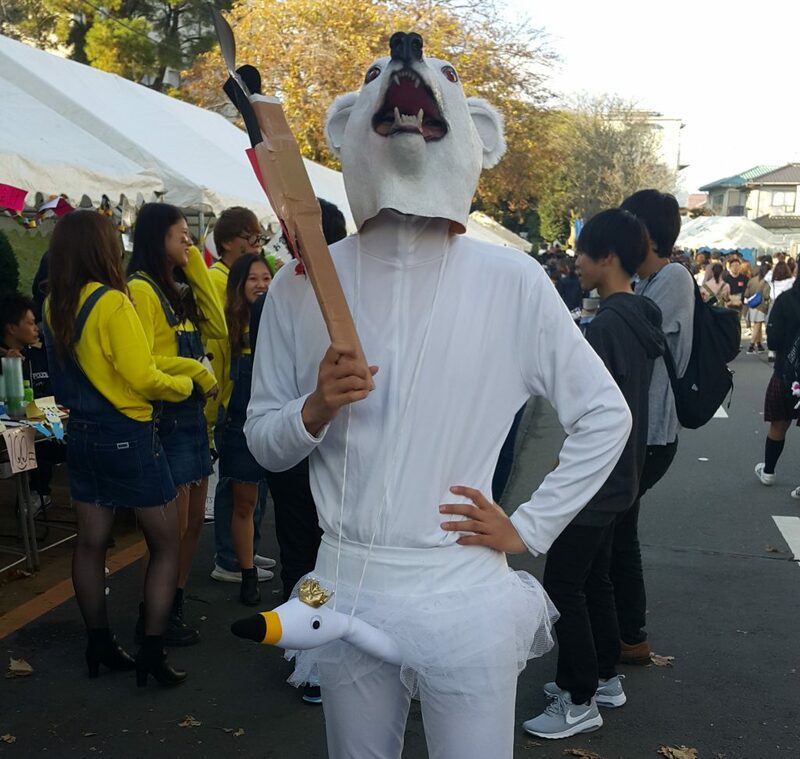 And of course, if you find it a little too scary, you can always head back out to the bright and welcoming faces of the students running booths outside. 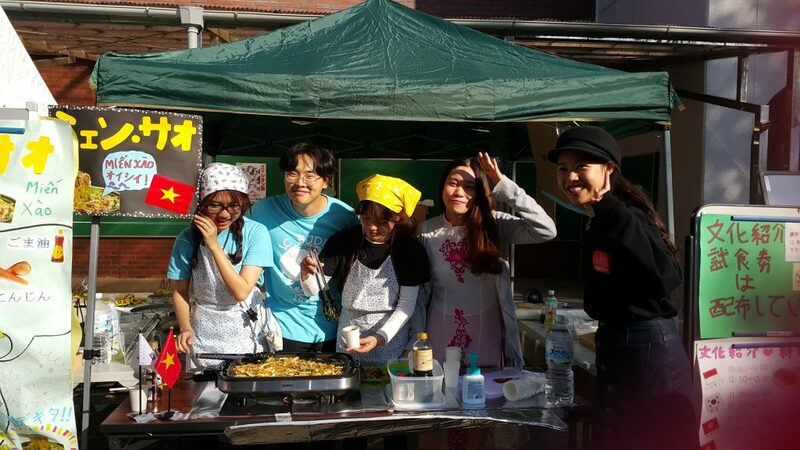 The international students cooking a delicious looking Korean dish. Now, there’s plenty more I could write about the culture festival at this point, but really, what’s the fun if I spoil it all for you when you could come and experience it firsthand? Just be sure to bring plenty of change for snacks, a friend or two, and a solid appetite for adventure, and I guarantee you’ll have an amazing time. Keep your eyes peeled and you may get the chance to see some sights that are…unique even for Japan.